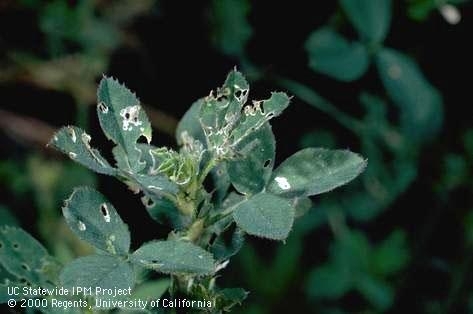 Alfalfa weevils, key pests of alfalfa hay, have been showing pyrethroid insecticide resistance within the Intermountain region, specifically in the Scott Valley area west of Mount Shasta. In some alfalfa fields, weevil counts have been off the charts with 100 weevils per sweep, FIVE times the economic threshold level. These same fields showed little efficacy on weevil control by pyrethroids. In a 2016 test only 3-15% of weevils collected from conventional fields died from exposure to pyrethroids. Weevils collected from organic alfalfa fields that had no exposure to pyrethroids showed a 92% mortality (Alfalfa Weevil Resistance to Pyrethroid Insecticides found in Intermountain Alfalfa Fields)(Table 1). Table 1. Percent weevil mortality from pyrethroids (Baythroid and Warrior), indicating pyrethroid resistance in Intermountain alfalfa fields (Orloff et al. 2016). The long crop rotation in the Intermountain area (sometimes 8-10 years or more) along with annual use of pyrethroid insecticides likely led to this resistance developing. It is critical to rotate different insecticide Mode of Actions (MoA) in alfalfa production to minimize chances for developing resistance for all insect pests. Rotating MoA's is typically recommended over mixtures of MoA's because mixtures of MoA's can select for insect resistant to both chemistries. Be sure that you are selecting a different MoA in your crop rather than a different active ingredient (a.i.) of the same MoA. For example, Warrior and Baythroid are different a.i. 's, but the same MoA (group 3A). More information on the different insecticide MoA's for weevil control can be found on the UC IPM alfalfa website for weevil control (UC IPM 2017). Three separate trials where initiated in May of 2017 in Scott Valley, CA to test various insecticide combinations for weevil control where pyrethroid resistance occurs. These studies were conducted by two extraordinary scientists, the late Steve Orloff and Larry Godfrey who contributed extensively to our knowledge about weevil control in alfalfa production. The results below are from the largest trial they conducted. 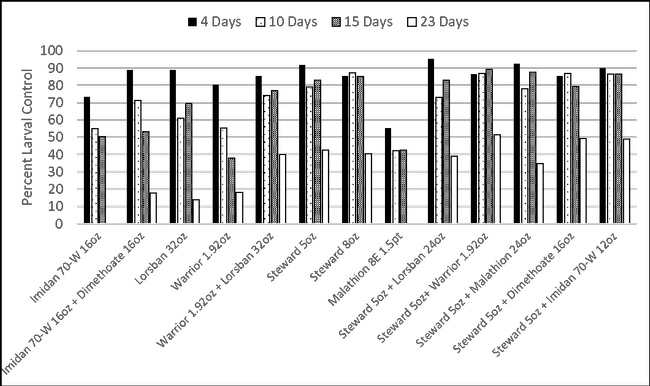 Figure 1 shows the number of weevil larvae/sweep in the untreated plots at the time of treatment and at the four assessment time points. Weevil numbers within the untreated plots were always higher than the UC IPM economic threshold of 20 weevils per sweep. Figure 1. 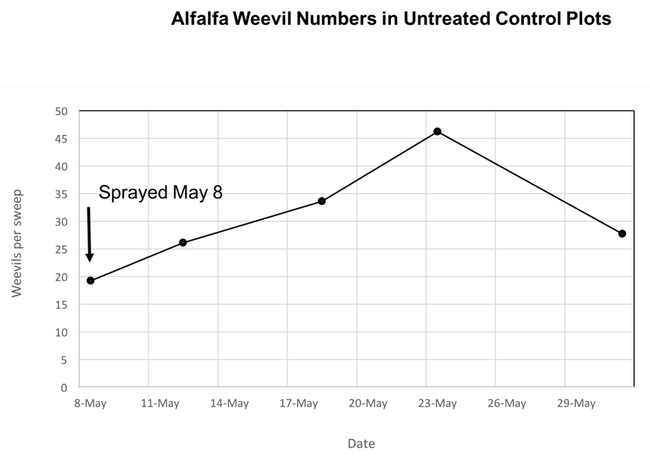 Number of alfalfa weevil larvae per sweep in untreated plots, Scott Valley, CA, 2017. 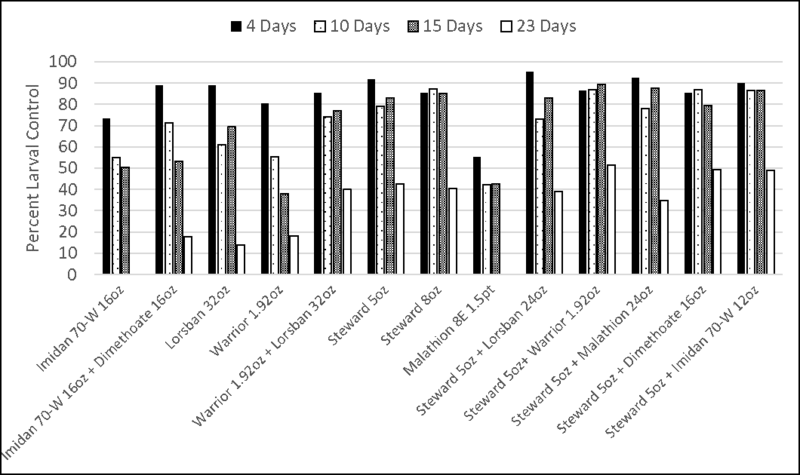 Figure 2 below shows percent weevil control for each insecticide treatment, 4, 10, 15, and 23 days after treatment in a field with weevil resistance to pyrethroids. Data from the other two trials can be found at Controlling alfalfa weevil: Efficacy, Thresholds, and Future Needs. All treatments provided at least 80% weevil control 4 days after application, except Imidan and Malathion alone. Ten and fifteen days after treatment only Warrior+Lorsban, or treatments containing Steward, offered at least 75 percent weevil control. The last weevil sweep was taken 23 days after application, at which time all treatments had broken. However, the treatments mentioned above still offered 40% weevil control 23 days after treatment. Figure 2. 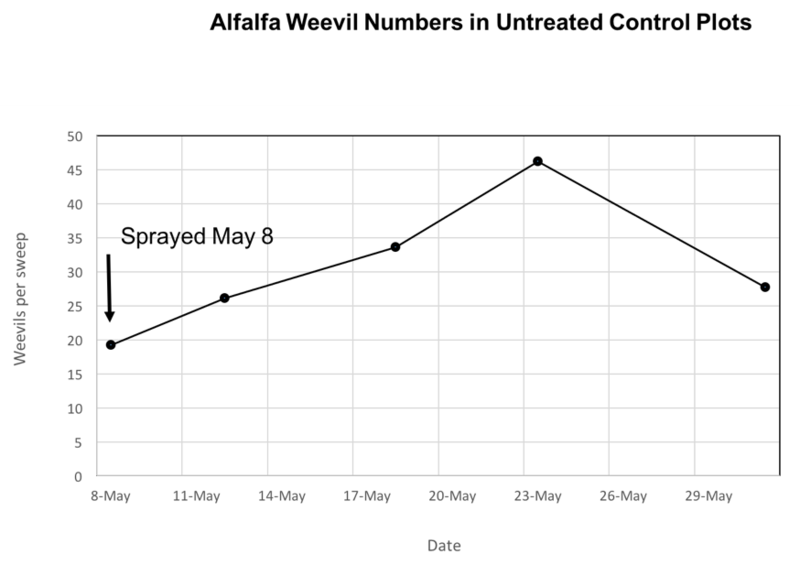 Percent alfalfa weevil larvae control 4, 10, 15, and 23 days after treatment in a field with pyrethroid resistance, Scott Valley, CA, treated 5/8/17. Results from the other trials were similar to this trial, but with less control from the Lorsban and Malathion treatments, addtionally Baythroid was also not efficacious on weevils. Steward was effective at all sites and appears to be a good option for pyrethroid resistant weevil control. Lorsban+Warrior may also offer sufficient control with a possible synergistic effect given a bit better control than either material alone However, continuing to apply Warrior in a tank mix with Lorsban to pyrethroid resistant weevil populations, could select for weevil resistace to both the pyrethroid and organophosphate MoA's. Malathion may not have the residual activity of other insecticides mentioned, but it may be a useful tool to alternate the MoA in weevil resistant fields and corresponding selection pressure. Sevin (carbamate) is also labeled for weevil control, however yellowing of the alfalfa can occur after application which is typically unacceptable. Because there are few new beetle insecticides hitting the market, it is ever important to preserve the insecticide tools currently available, such as Steward and other insecticides. First and foremost, altering/rotating the MoA of the insecticide applied is an integral part of resistance management. An additional step to help prevent insecticide resistance, may be to avoid treating the entire population of weevils either in time or space. This can be achieved by leaving small untreated sacrifice strips in the field, which can serve as refuges for weevils, so the entire population is not exposed to the insecticide. While leaving small portions of the field untreated will reduce yields, it could be part of a long term strategy to conserve the effectiveness of available insecticides, as has been shown to delay whitefly insecticide resistance in the desert southwest. 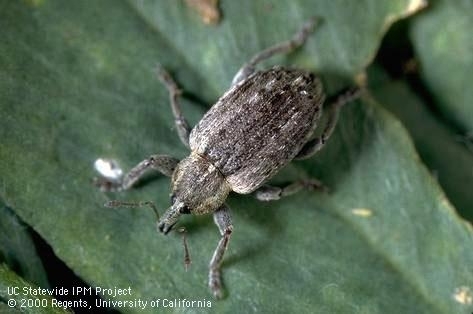 Development of pyrethroid resistance in Scott Valley emphasizes the need for more research to be done on investigating other insecticides to manage weevil populations and also to manage for preventing resistance from developing in the first place. Until we find some new weevil control materials, rotating insecticide MoA's to prevent resistance from developing is crucial, as discussed in First Principles of Resistance Management. Dr. Godfrey secured grant funding in 2016 from the California Dept. of Pesticide Regulation (CA DPR) to address the needs of alfalfa growers for managing weevils. The objectives of this grant are to investigate new insecticide chemistries for weevil control, reevaluate the economic threshold number that triggers insecticide applications, and to study the potential for weevil resistant alfalfa varieties. Currently this grant is managed by UCCE Agronomy Specialist Dan Putnam and Farm Advisor Racheal Long, who, among others, will be implementing research trials around our state in 2018 to achieve these goals. More to come.